Welcome! Enjoy this site as a resource. Filled with book reviews over Business, Investing, and Leadership. 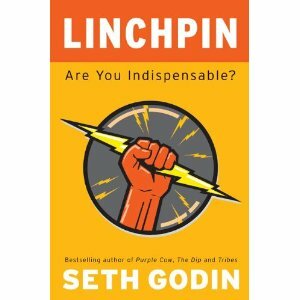 The book of the week was Linchpin by Seth Godin. The book is about identifying whether you are indispensable and if not, identifying what is stopping you. When we are kids we have such great imagination and huge dreams. Then we go into the schooling system and over the course of 12 years, we are somehow grounded. We are taught and encouraged to become cogs in a system instead of individuals. I think it really starts around 8th grade. And by the time we graduate high school, the leaders in our life have talked us into playing it safe. It's amazing when you meet those outliers or hear their stories because it seems to us like they did the impossible. Truth is, it wasn't impossible. These people are most commonly seen as CEOs or Entrepreneurs, but there are linchpins in a lot of organizations that aren't world renowned. However, those linchpins are celebrities within their organizations, making people ask themselves "What is it that they do that makes them so great?" The book introduces the idea that we all have gifts, the decision you have to make is whether you want to use those gifts or will you allow yourself to be bullied into not. The overarching theme I noticed throughout the book was the idea of fear stopping people from being great. People are afraid of thinking out of the box. More often then not employees are punished if they come up with a new idea and has a bad end result. At least that employee was passionate enough to try something new. You need to make mistakes to get better. And if you have employees that have that passion for what they do, it is the job of the employer to foster that passion. Even as an individual looking at your own job, it's difficult to take risks. There is something nice about flying under the radar and just doing your job. But you'll never be great it you continue that path. And as time goes on it is even more difficult to take risks. You have a wife, kids, mortgage, lots of miscellaneous expenses. "What if I mess up too bad and I lose my job?" you might ask yourself? Well what if you do something so great that there is no way that organization could go on without you. That is a linchpin. And besides being indispensable, you give your career some purpose. Who wants to keep the status quo for 50 hours a week for the rest of their lives? Mix it up! Do something great. People get great satisfaction out of things they are good at. Those things are your gifts. Use them. Fuel a passion that you have while at the same time helping your organization. We don't have a lot of time on this planet, so make the most of it. If you get fired because you took a risk to do something great then go get another job and feel proud that you tried to give your career more purpose than just being some boring cog in a machine. I liked this book. Godin has a lot of smart ideas that really get me thinking about my own life. As always, if you have any questions on the book don't hesitate to ask. I would be more than happy to help anyone that wants it. Right on. Passion is fun. Passion is life. Awesome Inc. theme. Theme images by Deejpilot. Powered by Blogger.